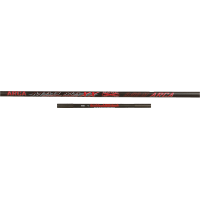 Powerful rod in HI-modulus cross carbon, ideal for carp fishing. Fishing rod with strong and tight action, numbered sections, non-slip grip. Sections A, B and C are telescopic. Extra reinforcement in woven carbon at the end of sections. The mini extension is part convert a 11 meter to 11,5 meters. Top with large front opening for the installation of an elastic band. Rod delivered in PVC tube. hoeveel van gewicht van draad ?